The Pleistocene often colloquially referred to as the Ice Age) is the geological epoch which lasted from about 2,588,000 to 11,700 years ago, spanning the world's most recent period of repeated glaciations. The end of the Pleistocene corresponds with the end of the last glacial period and also with the end of the Paleolithic age used in archaeology. The maximum extent of glacial ice in the north polar area during the Pleistocene period. The modern continents were essentially at their present positions during the Pleistocene, the plates upon which they sit probably having moved no more than 100 km relative to each other since the beginning of the period. ​Pleistocene climate was marked by repeated glacial cycles in which continental glaciers pushed to the 40th parallel in some places. 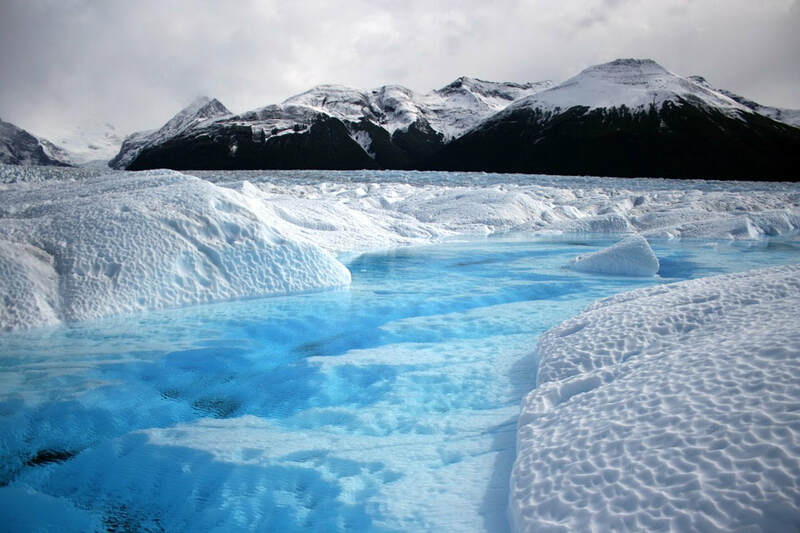 It is estimated that, at maximum glacial extent, 30% of the Earth's surface was covered by ice. In addition, a zone of permafrost stretched southward from the edge of the glacial sheet, a few hundred kilometres in North America, and several hundred in Eurasia. The mean annual temperature at the edge of the ice was −6 °C (21 °F); at the edge of the permafrost, 0 °C (32 °F). The effects of glaciation were global. Antarctica was ice-bound throughout the Pleistocene as well as the preceding Pliocene. The Andes were covered in the south by the Patagonian ice cap. There were glaciers in New Zealand and Tasmania. The current decaying glaciers of Mount Kenya, Mount Kilimanjaro, and the Ruwenzori Range in east and central Africa were larger. Glaciers existed in the mountains of Ethiopia and to the west in the Atlas mountains. In the northern hemisphere, many glaciers fused into one. The Cordilleran ice sheet covered the North American northwest; the east was covered by the Laurentide. The Fenno-Scandian ice sheet rested on northern Europe, including Great Britain; the Alpine ice sheet on the Alps. Scattered domes stretched across Siberia and the Arctic shelf. The northern seas were ice-covered. South of the ice sheets large lakes accumulated because outlets were blocked and the cooler air slowed evaporation. When the Laurentide ice sheet retreated, north central North America was totally covered by Lake Agassiz. Over a hundred basins, now dry or nearly so, were overflowing in the North American west. Lake Bonneville, for example, stood where Great Salt Lake now does. In Eurasia, large lakes developed as a result of the runoff from the glaciers. Rivers were larger, had a more copious flow, and were braided. African lakes were fuller, apparently from decreased evaporation. Deserts on the other hand were drier and more extensive. Rainfall was lower because of the decreases in oceanic and other evaporation. It has been estimated that during the Pleistocene, the East Antarctic Ice Sheet thinned by at least 500 meters, and that thinning since the Last Glacial Maximum is less than 50 meters and probably started after ca 14 ka. Both marine and continental faunas were essentially modern but with many more large land mammals such as Mammoths, Mastodons, Diprotodon, Smilodon, tiger, lion, Aurochs, Short-faced bear, giant sloths, Gigantopithecus and others. Isolated places such as Australia, Madagascar, New Zealand and islands in the Pacific saw the evolution of large birds and even reptiles such as the Elephant bird, moa, Haast's eagle, Quinkana, Megalania and Meiolania. The severe climatic changes during the ice age had major impacts on the fauna and flora. With each advance of the ice, large areas of the continents became totally depopulated, and plants and animals retreating southwards in front of the advancing glacier faced tremendous stress. The most severe stress resulted from drastic climatic changes, reduced living space, and curtailed food supply. A major extinction event of large mammals (megafauna), which included mammoths, mastodons, saber-toothed cats, glyptodons, the woolly rhinoceros, various giraffids, such as the Sivatherium; ground sloths, Irish elk, cave bears, Gomphothere, dire wolves, and short-faced bears, began late in the Pleistocene and continued into the Holocene. Neanderthals also became extinct during this period. At the end of the last ice age, cold-blooded animals, smaller mammals like wood mice, migratory birds, and swifter animals like whitetail deer had replaced the megafauna and migrated north. The extinctions hardly affected Africa but were especially severe in North America where native horses and camels were wiped out. The evolution of anatomically modern humans took place during the Pleistocene. In the beginning of the Pleistocene Paranthropus species are still present, as well as early human ancestors, but during the lower Palaeolithic they disappeared, and the only hominin species found in fossilic records is Homo erectus for much of the Pleistocene. Acheulean lithics appear along with Homo erectus, some 1.8 million years ago, replacing the more primitive Oldowan industry used by A. garhi and by the earliest species of Homo. The Middle Paleolithic saw more varied speciation within Homo, including the appearance of Homo sapiens about 200,000 years ago. According to mitochondrial timing techniques, modern humans migrated from Africa after the Riss glaciation in the Middle Palaeolithic during the Eemian Stage, spreading all over the ice-free world during the late Pleistocene. A 2005 study posits that humans in this migration interbred with archaic human forms already outside of Africa by the late Pleistocene, incorporating archaic human genetic material into the modern human gene pool.